Artisanal chocolates, delectable truffles, hand-spun caramels: These five Kansas City chocolatiers all make tempting handmade treats and gifts that could stand in for works of art. Some also serve authentic European espresso and excellent drinking chocolate. One offers lovely café-style meals as well. Stock up on some of these beauties to take home or give away, but don't be surprised if they don't last long. In every case, consult the company website for the most up-to-date hours, prices, and menus. It's easy to mistake the colorful gems inside Christopher Elbow's display cases for works of art. 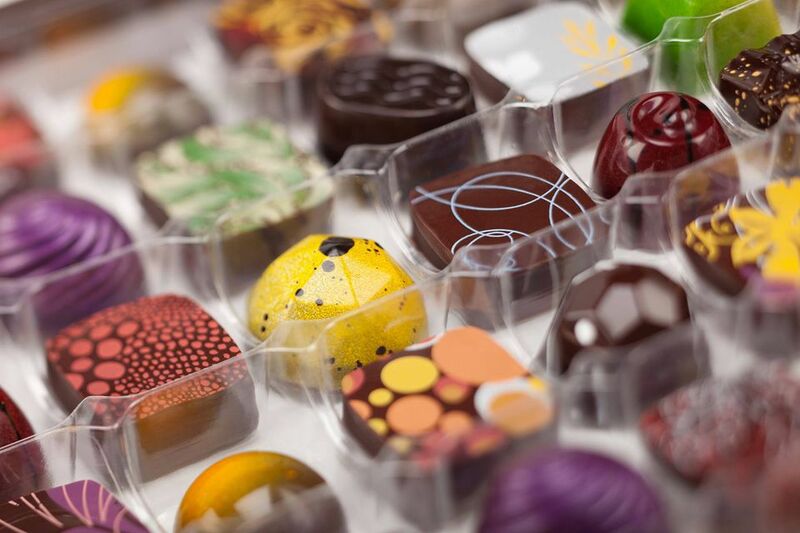 The famed chef masterfully combines unusual flavors (champagne, bananas Foster, tequila lime) and chic designs to create truly gift-worthy chocolates. When you visit his sleek shop, try a cup of fantastic European-style espresso or his drinking chocolate. Located in a gorgeous shop in the heart of the Country Club Plaza, Panache has been one of Kansas City's premier chocolatiers for four decades. Fill up on handcrafted milk or dark chocolate bars, bonbons, and truffles; chocolate-covered Oreos; molded Colombian chocolates and caramel chocolate "Poppo" (dark chocolate–drenched caramel popcorn). Give a gift collection of a few different types of chocolate, and the recipient will even appreciate the shop's exquisite black boxes with gold lettering and gold satin ribbons. Bizz & Weezy makes chocolates of many stripes, but it's the smooth, creamy caramel filling that is a standout. The treat is undeniably the best in the city and goes well with all those artisanal chocolate barks, bars, truffles and huge turtles with cashews, almonds, pecans and, of course, caramel. The fancifully designed chocolate-covered Oreos are the perfect gift by themselves or as a featured product in a Bizz & Weezy gift basket of chocolates. The owners of this gem get high marks from patrons for being very, very nice. They are real chocolate experts and even teach the masses about chocolate making and chocolate painting using only the finest ingredients. André's Confiserie Suisse is a family-owned chocolaterie and bakery that has been a Kansas City institution for more than 50 years. Order a chocolate dobosh torte (a seven-layer cake covered in ganache) for your next party, stock up on pretty boxes of European-style dark and milk chocolate truffles. An excellent souvenir is the pastel-colored macarons or a set of chocolates in the shapes of Kansas City landmarks. The two locations, in addition to selling high-quality chocolate, pastries and coffee, are also tearooms with full café menus. Drugstore favorite Russell Stover began churning out chocolates in 1923 when Mrs. Stover started selling her high-quality, handmade chocolates from a bungalow in Denver. Now those assortments get their start in four manufacturing facilities, including one in Kansas City, where the famous candy company is now based. The company has changed hands over the years, going from privately owned to publicly owned and back to private; and it acquired several other candy brands along the way. The renowned high-quality Swiss chocolate maker Lindt & Sprungli bought out Russel Stover Candies and its Whitman's Candies in 2014. Russell Stover chocolates are still available at most corner drugstores and every other place that sells mass-produced chocolates, as well as on the Russell Stover website.